The club itself isn’t much to look at: a basement space adorned with posters and TV screens, a couple of pool tables—pretty simple. 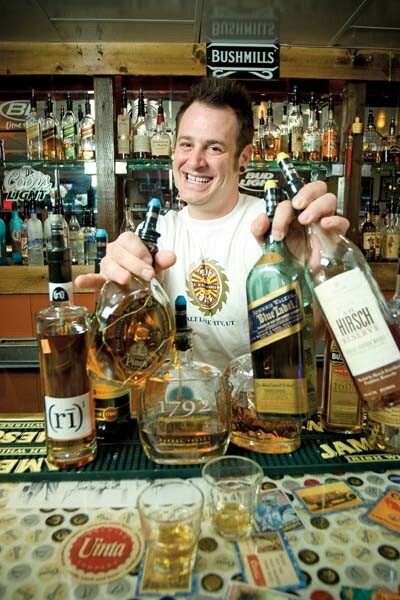 But take a look behind the bar: 50 different whiskeys—who knew you could even get 50 different whiskeys in Utah? If your taste extends beyond Jack and Jim (and it should), it’s better than 48 trips to the liquor store—A Bar Named Sue also offers 42 beers on tap, a tasty menu of pub grub and a free jukebox and pool. A classic college hangout, Fat’s Grill & Pool has pleasures that reside in its honest commitment to delivering the goods. 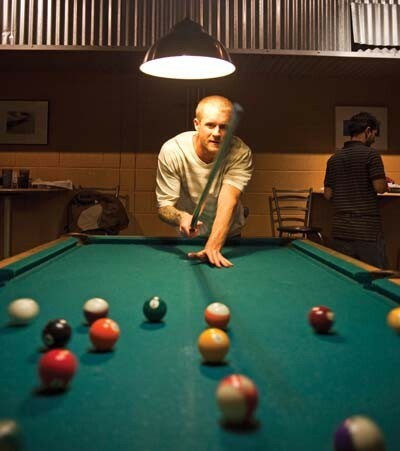 The pool tables are a very reasonable $9 per hour. The evenings quickly see them fill with students stretching out over the green baize when they’re not sucking down suds. The unexpected delight of this venue, though, is its focus on quality food. Tasty thin-crust pizza and a Reuben sandwich with grilled bread and fresh sauerkraut that City Weekly food critic Ted Scheffler raved about in one of his columns reflect Fat’s concern for standards and culinary pleasure. When you next get the urge to try out a little English on a cue ball, enjoy well-cooked comfort food or hustle your friends for a few bucks, give Fat’s a whirl. You won’t be disappointed. We’re not licensed to prescribe cures for libido issues, but if you’re looking to give yours a second opinion, Habits is the place to give it to you. In a city with lots of options, Habits sets the standard for great-looking people wearing the styles to match. Maybe that’s due to a strict dress code that keeps the standards sky-high. Or maybe they’re attracted by the appetizers and sushi—but we doubt it. Habits has always prided itself on presenting a class atmosphere, and their work pays off. This is a place where both guys and gals come to faint. No matter your age or attitude problem, it’s frankly impossible not to have fun at Fat Cats. Besides tenpins, there are arcade games galore, pool and The Pizza Factory. The lanes include automatic scoring, and gutter bumpers are available for little bowlers. In the evenings, Fat Cats turns into Thunder Alley. The black lights and music come up and the light show and fog machines are switched to the “on” position. What’s not fun about that? If you don’t have a smile on your face after a visit to Fat Cats, it’s time to take a serious look at where you made that wrong turn in life. Park City may be where the stars come out in January, but there are plenty of good reasons to take in a Sundance show in downtown Salt Lake City. The crowds aren’t as crazy, the snow isn’t as deep, and—if you’re taking in your show at the Rose Wagner Center—you’ll have a unique refreshment option. Yep, the Rose serves beer, allowing patrons to sit down to their dose of indie cinema just like they were at Brewvies. It sure could make those post-screening Q&A sessions a little livelier. Who knew the Salt Lake City Arts Council would follow up 2007’s stellar Twilight Concert Series with an equally impressive lineup? We did—how could anybody lack faith in a group of trailblazing organizers who work ‘round the clock to ensure local audiences have free access to some of today’s top musical performers? Artists featured in 2008 included Broken Social Scene, Neko Case, Tim Fite, Crooked Fingers, Nada Surf, The Roots, De La Soul, Yonder Mountain String Band, Keller Williams and Josh Ritter. Twilight is becoming less of a welcome surprise, and more of a valued institution. Coming up this year: The Black Keys, Sonic Youth and more! Red Door doesn’t stop at “shaken or stirred?” The classy downtown drinkery supplies a mostly hip, stylish clientele with seemingly endless variations on the classic cocktail, from sweet neon-hued drinks to the traditional gin giblet and dirty martini—straight up, no olives. A hot night spot with live jazz and DJs performing on weekends, the downtown bar is also a quiet haven after work. Stop by and ask for the bar’s best whiskey. Sip slowly. Feel classy. It ain’t big, and that’s the way they like it: The W Lounge is the specialty-boutique answer to big-box clubs, a place where dancers with discerning ears come to enjoy quality electronic beats, not endure a generic Top 40 thud crowded by the sweaty masses who wouldn’t know Ibiza from IHOP. The W pulsates seven nights a week with electro, new wave, Britpop, garage, house, break beats and more; mostly spun by the best local DJs, sometimes international talent, never wrong for the room. Listening to music while dining out can be distracting. It’s either too loud and disruptive or too soft and liable to get lost in the din of the meal service. Ryan Miller’s live music offers a perfect blend of acoustic guitar and vocals to accompany the meal. He tastefully chooses songs that fit the mood of the room, at a comfortable volume. His voice is impressive, with a wide range that normally would take two singers to cover. A good meal begins with the visual presentation, then an appetizing aroma, and of course, a wonderful taste. Miller supplies diners with a stimulus for their fourth sense, and it sounds delicious! Today’s country & western bars, much like modern country music, have little sense of tradition—they consider Keith Urban a real cowboy and “Boot Scoot Boogie” a “classic.” On the first and third Thursday of the month at The Woodshed, local alt-country bucks Band of Annuals remedy this sad situation with “Cowboy Ramble,” a full night of real country classics performed with a rotating cast of guest vocalists and players—they even encourage the audience to arrive gussied up in their best western wear. The intimate environ of The Woodshed lends itself well to the twang—and the cheap drinks don’t hurt, either. It ain’t easy getting drunk in a recession. Even the occasional after-work cocktail seems like a luxury in these trying economic times. That’s why we can’t give enough gratitude to Cheers to You for providing so many worried souls such needed relief. With generous steins of domestic brews ranging from Bud to Killian’s costing only $2.50, and microbrews from Cutthroat to Blue Moon only $3.50, it is possible to drown your troubles without significantly adding to them—monetarily, that is. For the really hard up, it’s hard to beat this drink special: Wednesday nights, any cocktail for two bones. That’s right: just $2. For the money saved, it sure is a classier alternative to drinking from a plastic fifth of Kamchatka vodka in the alley behind the liquor store. This bar goes deep—as in, it’s nowhere near as small as it looks from the front. 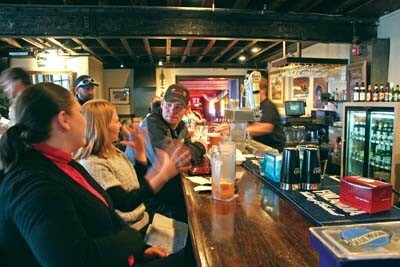 The Poplar Street Pub is as warm and roomy inside (and out on the patio) as the emphasis is straight and simple: A handful of munchies on the menu, a whole lotta beers on tap, and enough games and TVs to keep you occupied in between. This should be—and obviously is—your new favorite hangout.